My friend Sara and I had the honor of throwing Alaina a baby shower a few weeks ago. We decided with a bird theme and it turned out super TWEET.... I mean, SWEET. Elisha (Alaina's sister-in-law) made these FABULOUS invitations! For fun we put bird seeds in the envelope with the invite, haha. Here is our food buffet, I'm in love with it! they just make my heart happy. Alaina's mom made all the dessert. but how could we resist some PEEPS! Bobbie made "nests" out of rice crisps and filled them with candy eggs and gummy worms. So excited for the Guido family and I can't wait to me the new baby! So creative! I agree it's a gift and you are definitly using it for His glory!!! oh my gosh carrie! not gonna lie, i hadn't read your blog in a while, so i just sat here and caught up with you...you're amazing!!! i am continually stunned by your creativity! you could make a living off of all your ideas!! i love it!!! this was definitely one of THE cutest baby showers i've ever been to! It was such a wonderful shower! I am so blessed to have such creative and awesome friends. 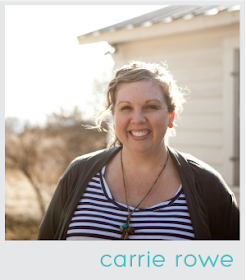 © Carrie Rowe 2012. Design by Sarah Adams. Powered by Blogger.